Preparation: Bring a photo or model of a snake and a T-shaped stick. Have you ever been so sick that you couldn’t go to school? (Let children respond.) Have you ever been so sick that you could not move at all? So sick that the only thing you could move was your eyes? In the Old Testament book of Numbers, in chapter 21, we find the story of how the Israelites, after they had been rescued from slavery in Egypt, were complaining about the food and lack of water. God was leading them to the Promised Land, but it was taking too long; they had to walk and walk and walk and they were not content. They went so far as to yell at God and say, “Why did you even bother taking us out of Egypt if we were just going to wander about in the desert forever?” So God sent some snakes to bite them and remind them what real suffering was. Seems harsh, but they finally realized what they were doing and cried out to God for mercy. The people were dying of snake bites and now were so sick that they couldn’t walk and walk. Now they couldn’t even move. It is kind of ironic, you know. First they were complaining that they had to move around for so long; they had to wander in the desert. Then after the snake bites, they couldn’t move at all and wished they could at least move. God had pity on them again and told Moses to help heal the people who had been bitten and poisoned by the snake. Do you know how he helped to heal the people? It was a strange cure. He told Moses to make a snake out of bronze, like a kind of metal statue and put it up on a pole. 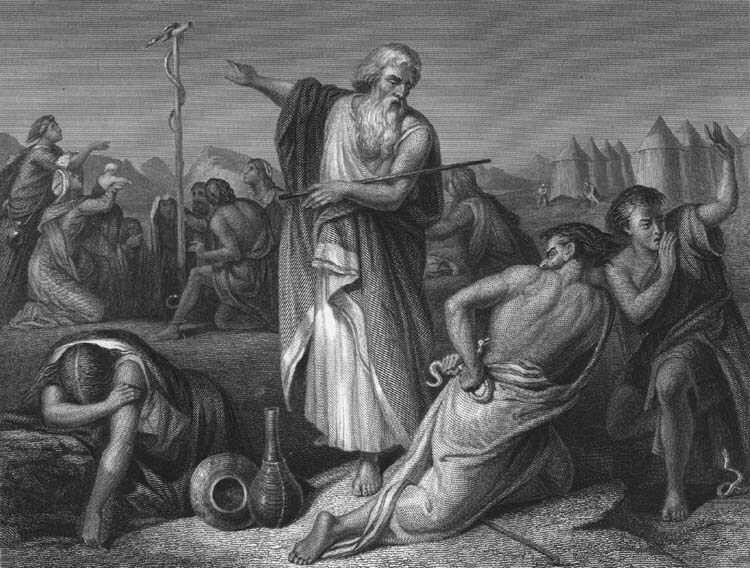 Then Moses was supposed to carry the snake on a stick into the tent of the person who lay dying from the snake bite. All the person had to do was to look at the snake, and they would be healed. These people were so sick, they couldn’t move, but they could still move their eyes. They could look at the snake on a stick. If they refused to look to the snake, they would die. We may all look healthy on the inside and may be able to walk about and move, but inside of each of us, there is sin. Inside each of us, there is the spiritual sickness of sin and separation from God. We can do nothing to heal this sickness. It is as if we are poisoned like those Israelites and cannot move. God provides the cure. He raised Jesus up on the cross and all we have to do is to look to Jesus. We look to Jesus and we are saved. Prayer: Thank you, God, for raising Jesus up to die for us on the cross. Thank you for sending Jesus to be our healing and our salvation. Help us to turn our eyes and hearts to Jesus, our Savior.